Saudi Electrical Efficiency Forum and Exhibition Gallery: Clique Solar, India’s first solar boiler company, presented its technology at another international platform earlier this year. This was the Saudi Electricity Efficiency Forum and Exhibition It was accompanied with specialized workshops intended to be presented by specialists from Arab and international agencies with high profiles in this domain. The event motivated major companies working in energy conservation, renewable energy, green building and smart buildings. Some snapshots from SEEFE. 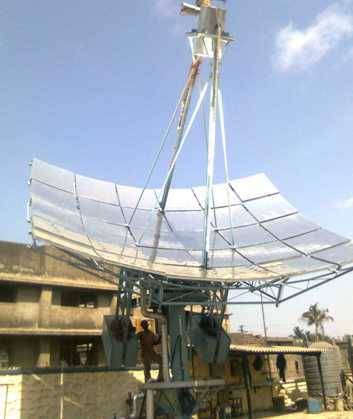 Intersolar Exhibition Mumbai: Intersolar is the biggest exhibition on Solar Energy in India. Everyone who has interest in Solar energy is present at the exhibition. The exhibition along with the conference enjoys high degree of credibility and has attained a stature in the market. Clique Solar, India’s first solar boiler company, has been participating in Intersolar since its inception and the response to our stall has been overwhelming. Few pictures from Intersolar. Intersolar Awards: Clique Solar’s NTPC solar cooling project at Greater Noida has been adjudged as ‘The Best Solar Project’ Award at Intersolar India 2012. The Awards were open to all 3100 Intersolar exhibitors. Images and videos of the Intersolar Award ceremony organized in Mumbai in November 2012. We are proud of this recognition that helps us strengthen as the solar boiler company that is effective, relevant and performance driven. Clique Solar Video Gallery: We thought of interesting ways to portray ourselves and our technology so that it’s easier for you to understand who we are and what we do, thus these short videos. Watch them to learn more about Clique Solar , India’s first solar boiler company and ARUN®, CST technology, better.